This redevelopment project at the Bon Accord Shopping Centre in Aberdeen involves a series of careful interventions and additions, to provide an enhanced experience for those visiting the centre for both shopping and entertainment. The key move is the creation of a new 6-screen cinema, which is to be constructed within the structural shell of an old bowling hall on the upper level of the shopping mall. 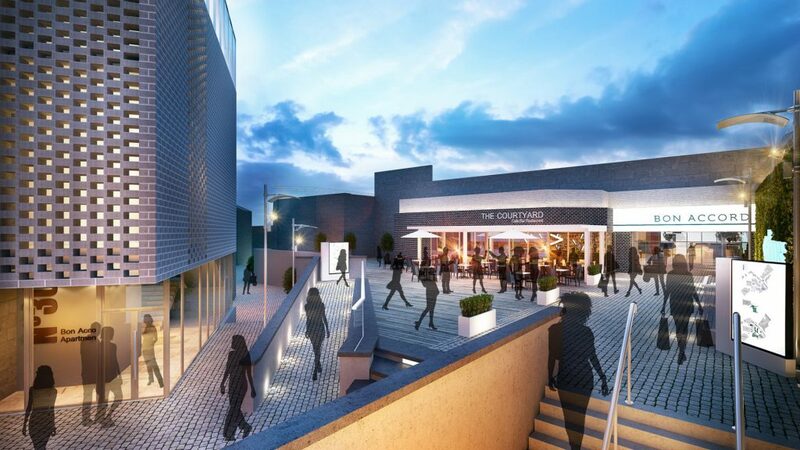 Other key challenges involve the provision of new vertical circulation through the existing busy shopping centre integrated with the main cinema development. The design proposals involved careful assessment of the existing condition of the 1980’s reinforced concrete framed structure and its capability for accommodating the new proposals in the long term. Extensive intrusive reinforcement investigations were carried out, to allow accurate modelling of the structural behaviour, particularly with the introduction of a new suspended concourse level and raking steelwork to suit cinema tiered seating. The design of the cinemas required a careful approach in the coordination of the built structure and fabric, to meet the desired acoustic performance levels whilst maintaining the extent of construction works, within the confines of the existing structure. A new vertical circulation link involved the design of a suspended lift, which is supported between the upper mall floor levels to avoid new columns within the main circulation space of the mall at ground floor level. This required a complex cantilevering steel structure supported on the underside of the existing reinforced concrete framed structure at each of the upper floor levels, to ensure uniform distribution of the applied loadings. The installation of these new interventions required careful planning and coordination with the design team, contractor and centre management to ensure works are completed with minimal disruptions to the day-to-day operations of the shopping centre.